Shooting out in the cold… Brrr, you know the feeling. In the wintertime you can’t hold your camera gear with bare hands (if you don’t want to freeze your fingers off). But you also can’t rely on regular winter/battery heated gloves because they’ll likely interfere with your shooting process/camera control. Luckily for us, there are plenty of photography-friendly gloves on the market right now. And in here, I have a list of the 10 best winter gloves for photographers in 2019. 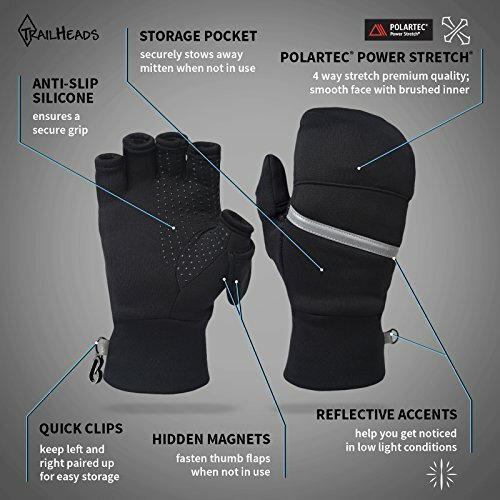 These gloves and mittens have the flip back finger caps and/or touchscreen fingertips, and a design that’s convenient for camera management (or anything else you do outdoors). 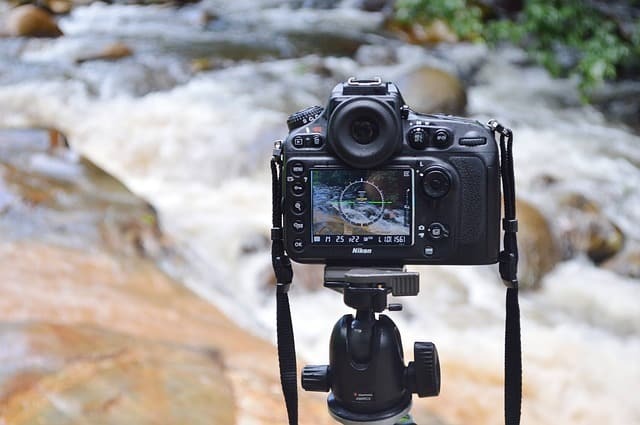 When shooting outdoors this winter, you’ll be warm and, more importantly, have the tactile control you need to operate a camera. Originally, I placed this product fourth in this list. After seeing a LOT of my website readers purchase this particular product, I realized that it’s hugely popular among photographers and decided that it deserves a #1 spot here. There are truly a lot of things to like about these flexible gloves. 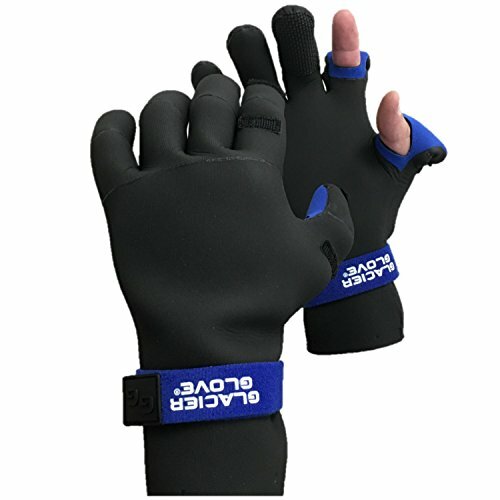 They are convertible gloves that are great for many sports/outdoor activities in the cold. They also have a water-repellent fabric and good build quality. Suitable for mildly cold weather conditions. Unlike many products in this list, Palmyth gloves are a lot cheaper. Anyway, let’s talk more about what you’ll love about this product. The price tag of this pair is under $35. Now that we’ve established the things you’ll love about Palmyth gloves, let’s discuss the things you might not like. While this pair has a water-repellent fabric, it won’t save you from heavy rain/snow. Not suitable for extremely cold winters. This is pretty much the biggest downsides of these gloves. I think these gloves are underrated. Not to mention that they are highly affordable too. Because they were created for winter photographers BY photographers. It’s a great glove for winter photography without compromising on functionality or style. What exactly is there to love about this product? SD card pockets on the back of each hand (with a zipper). Pro Tip: You may try to add small hand warmers in those SD card pockets to keep your hands even more warm during cold days. 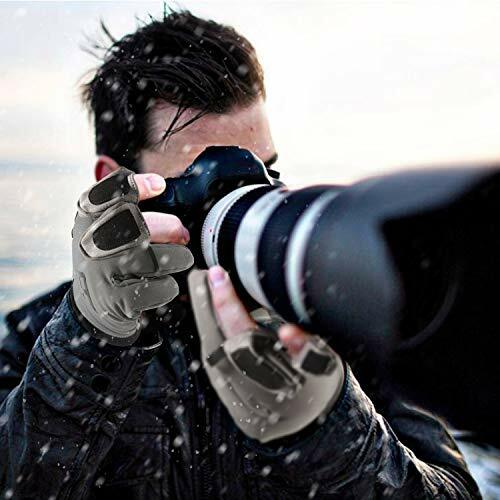 Keep shooting in the cold with these gloves designed specifically for photographers! 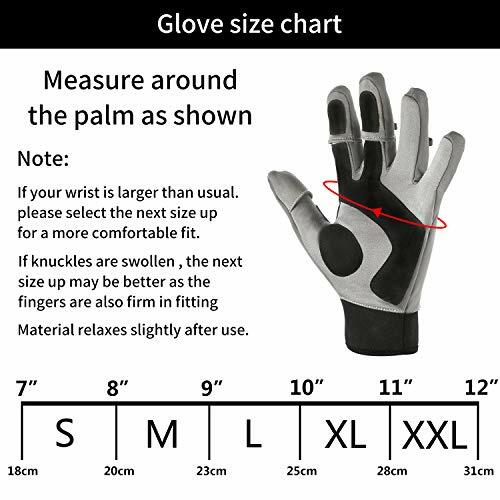 Due to design of the gloves, you won’t have much finger dexterity (in case you’ll need precision). 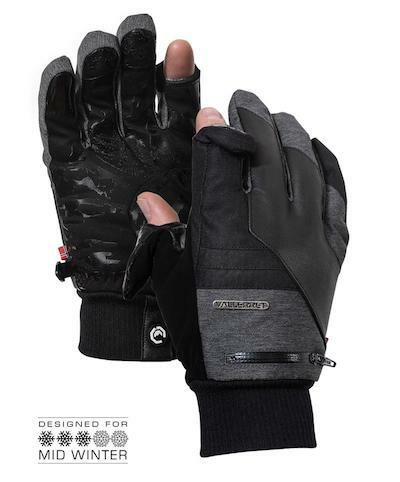 This glove is designed for every day use in mid winter. If you want alternative options for deep winter or, let’s say, arctic photography, then you may want to consider Ipsoot photography gloves instead. make it very easy to work with a camera. 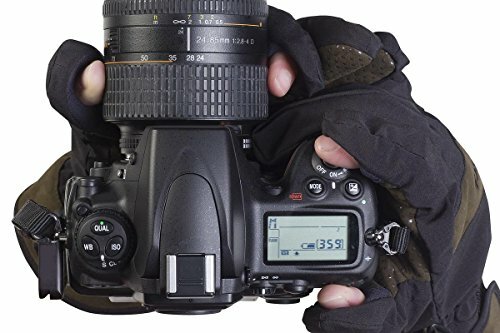 These are one of the best gloves for photography outdoors. Keep in mind that as of now the gloves are available on Amazon US and UK only. I encourage you to read my full review on Vallerret Markhof Pro 2.0 gloves here. Without a doubt, this is one of my top picks. This pair offers photographers an extremely warm protection from cold weather. They are really designed for brutal winter conditions and are used not only for photography but also winter sports activities you enjoy outdoors. This product was originally designed for Special Forces for its grip, dexterity and warmth. have more insulation (therefore are more warm). I know that this product is a bit pricey, but it certainly is well constructed. and, of course, the ability to touch the screen without taking them off. These aren’t fingerless/half-finger gloves so, for example, turning rotational dials on a camera might be a bit difficult. These are amazing if you’re shooting in subzero temperature (hmm, arctic photography comes to mind here). Heat 3 Smart gloves certainly are one of the best ones for winter photographers. FRDM Gear is a rather young company that started its growth in 2017 and within a short period of time they managed to gain insane popularity among winter photography enthusiasts. Because these midweight gloves are high quality and simply retain dexterity for using your fingers when photographing. 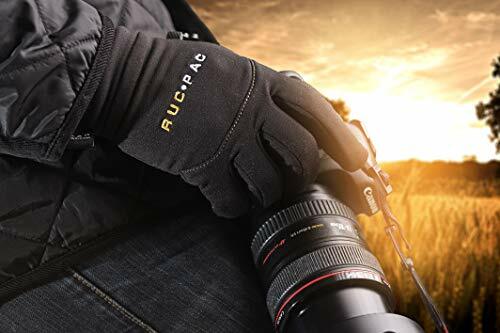 Not only are these convertible gloves great for photography in the cold, but also hunting, fishing, hiking, skiing etc. 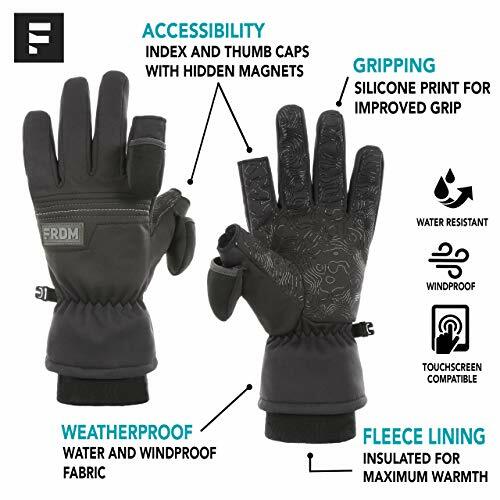 FRDM gloves are pretty much a dream for avid outdoors people. But like anything else in the world, this product isn’t perfect. So let’s look at its disadvantages. 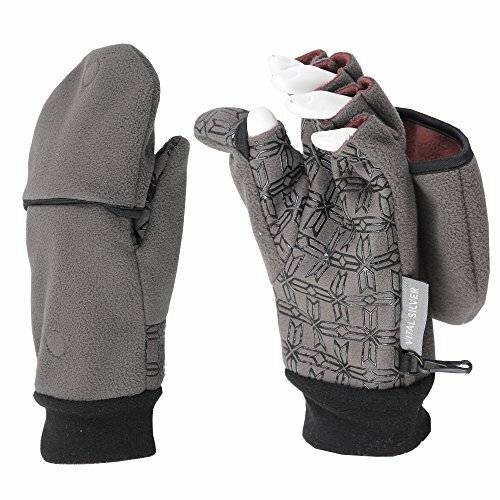 While this pair is great for cold weather outdoor activities, don’t use them if it’s less than 40ºF (5ºC) out if you don’t want to freeze your fingers off. It isn’t insulated in the same way as ski gloves are for example. However do keep in mind that it comes with 3 layers, so you’ll be warm as long as it’s 40+ ºF temperature. First, you should determine the circumference. To do that, measure around your dominant hand at the widest part of the palm (see image above). Then, you need to determine the length. To do that, measure the length of your dominant hand from the base of your palm at the wrist to the tip of your middle finger. Without a doubt, FRDM are one of the best photography gloves for winter shooting on the market right now. This product comes with a 1 year warranty should these gloves have any defects (within the normal scope of use). Point is… These gloves are certainly worth buying for 2019. Vital Salveo with bamboo charcoal and germanium fiber is part of the 3WARM series that are designed in a way to keep you warm and comfortable during those chilly winter days. These are half-finger type gloves which means that you can easily work with your camera or anything else. (And then cover your fingers with the mitten cover whenever needed). And just like the first two items on this list, Vital Salveo gloves are water resistant and windproof. What will you like about this product? And what you might not like about this product? While Vital Salveo are water repellent, they are not fully waterproof. Suitable for mildly cold winter, not recommended in extreme weather conditions. 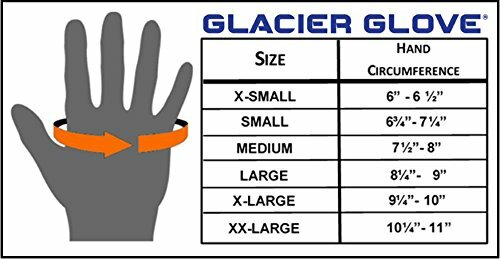 These gloves are great for most cold weather activities, whether its hiking, skiing, or even outdoor work. Vital Salveo offer high quality products, so I definitely recommend checking out this gloves for outdoor winter photography in 2019. TrailHeads mittens are pretty popular among photographers and outdoor sports enthusiasts. And it’s not surprising given its versatility, comfort, and well-thought out design. Stephanie Raftery, the founder of TrailHeads company, is committed to making her customers happy. So… if you were to order this pair and aren’t satisfied, you can return them whenever. has reflective strips for enhanced visibility. I truly believe you’ll like the way these gloves were designed. But let’s discuss the things you might NOT like about this particular product. not warm for extremely cold weather, definitely will work for fall or spring-like weather. These gloves are designed for active wear but certainly can’t be used for standalone used during cold winters. 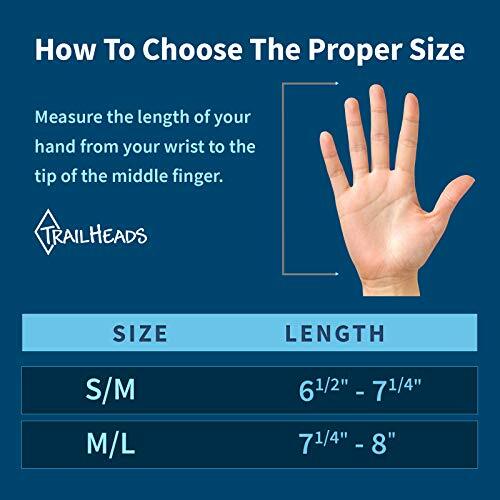 Choosing the proper size gloves certainly is easy with TrailHeads. Like I said earlier, these gloves aren’t designed for extremely cold weather conditions but I certainly love them for a number of reasons. These cute convertible mittens are for you if you like activities outdoors in a mildly cold weather. The button below send you to photography gloves FOR WOMEN (because it has more Amazon reviews that you can read). 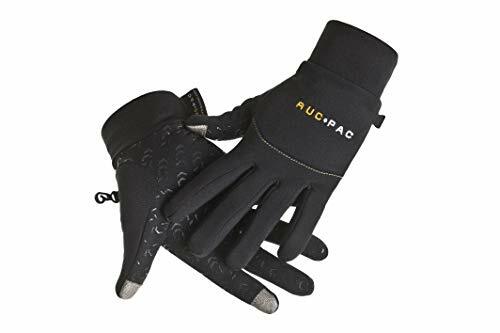 RucPac company strives to bring the gloves for using tech equipment on location, whether it’s a camera, a smartphone, a laptop, or anything else. This product isn’t supposed to be used if it’s extremely cold outside but it certainly has its benefits. Oh, RucPac also have rubberized palms for a strong grip of your camera. Thumb and pointer finger tips aren’t cut off. The build quality is pretty good but not as good as previously mentioned gloves. As you might’ve guessed already, these aren’t the gloves that will help you during extremely cold weather. Unlike previous products, you won’t have to measure anything. 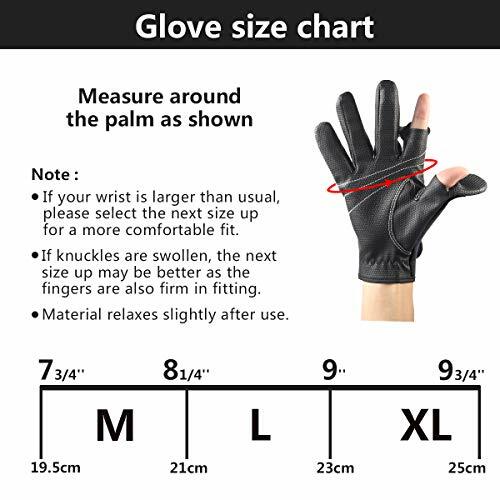 These gloves come in 2 unisex medium/large and small sizes but it has stretchy material so it’s unlikely that you order a wrong pair size. These gloves do a good job providing good sensory feedback whatever technology you’re using. I mean you can text, you can write, you can shoot, do photography and so forth. And if you’re looking for elegant gloves for non-extremely cold days, these are for you. This pair is similar to #2 on the list (by the same company) with a few differences. They have 2 cut fingers, instead of 3. These Palmyth gloves aren’t as cold weather insulated as the ones I mentioned earlier. Also, I think they are less stylish too. While this product receives good feedback, there are a few things you might not like about them. not everyone will like the neoprene material. Other than that, this pair is pretty good. The way these gloves were designed for MANY outdoor activities, including photography, hunting, (kayak) fishing, hiking, shooting etc. It costs around $20. These are definitely the “best value for price” gloves. While these neoprene gloves were originally designed for fishing, they certainly are photographer-friendly. will keep your hands pretty warm. As you can see, this product does meet basic requirements for photography out in the cold. While I personally never went to Antarctica or Alaska photo expedition, a few wildlife photographers confirmed these gloves worked great for them. What are the things you might not like about this pair? And if you’re a Canadian like me, then you might want to consider Heat3 Smart or FRDM gloves instead. Personally, I’d go with with other glove choices for a number of reasons. 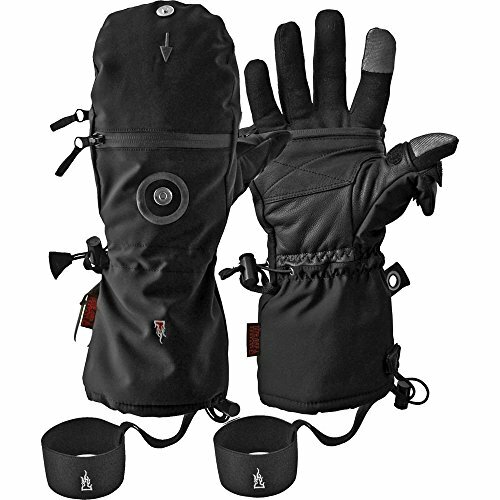 If you like fishing as much as you do photography (in the cold and in the rain), these gloves might be your best choice. This is my least favourite product. I just don’t like them. But I know it’s widely used among winter photographers, so I decided to be objective and still add it to this list. warm enough for mildly cold weather. Let’s discuss the things you might not like about these gloves. No wonder why I don’t like them much. But don’t let my subjectivity get in the way! AquaTech gloves certainly are used by many people for outdoor photography. To be honest a $50 price tag isn’t reasonable for this particular pair of gloves. There are a lot better gloves for photography in the winter that offer better design and overall level of warmth and comfort. It’s one of those products where they have a great idea but less than great execution. I know that some photographers prefer glove liners with touchpad sensitive finger tips (like lightweight Aegend, for example). Keep in mind that those won’t save you when it’s minus 30 degrees outside, and they might not be the best choice when holding your camera gear. The aforementioned products do a great job keeping your hands warm when doing photography (or any other winter activities you participate in). Gloves are certainly the cold weather photography gear that you should buy. I mean how else to keep your hands warm during winter shooting? I really hope you found a pair of gloves that suits your needs best. What are the specific things you look for when buying photographer-friendly gloves? Have you tried any of these products in the past? Did you enjoy this list of top rated photography gloves for 2019? Would love to hear your thoughts in the comments below! 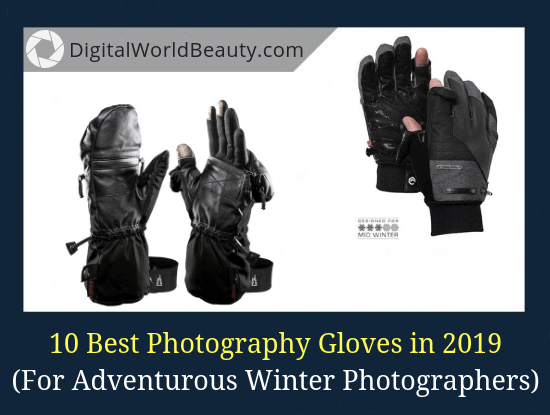 I am so glad I found your list for the best gloves for cold-weather photographers. Super helpful. I am more of a beginner so I hadn’t really thought of the accessories I will need for winter photography vs. summer. But with it being winter now, I have been thinking of how to wear gloves to keep my hands warm and take pictures at the same time. From what I have read here, it sounds like, in addition to photography gloves, I should consider hand warmers too. That is a great idea! I also enjoyed the link to how to gear up for winter shooting. It is a comprehensive guide for everything I need to think about including gloves, backup batteries, testing my camera gear before taking photos in the cold, etc. For buying the photography gloves for me, it sounds like I need to know a few things before I buy. – what features I want (the SD card pockets in the Vallerret Markhof Pro gloves seem like a handy feature). Thanks again for this helpful list! 1). Yeah, when shooting out in the cold, having proper gloves is a must. There’s like this dilemma: you can’t take photos with regular gloves, and without any gloves you’ll just freeze. Brrrr. That’s why I focused on photography-optimized gloves that have the necessary features like removable fingers caps, good grip and so forth. Hand warmers is an option for photographers if it gets REALLY cold outside. Though if it’s deep winter, Heat3 might be one of the best choices for you. 2). Glad you enjoyed the guide! I am happy to link out to other photography resources online as long as they help my blog readers. 3). Yep, you got it all correct. Also, if you decide to choose gloves that are not from this list, definitely look out for the good grip. Last thing you want is for your camera to slip out of your hands! Speaking of Markhof Pro 2.0 gloves. I just published my full review here, in case you’re interested in learning more. I know this pair can be quite expensive for some people, but it offers such high quality that I think it’s very well worth it. Thanks for your reply Zarina! I’ll check out the new review. Sorry to hear about your ankle. Hope you back out taking pictures soon. Gloves have sure come a long way over the years. These are not the gloves I was used to as a kid but as a photographer you still need to keep your hands warm and work at the same time. I had gloves that didn’t do the job because my fingers froze right through the gloves. But these all look like they would really keep your hands and fingers warm. There is quite a difference in price with these. I would want something that works, but $200 is steep! Which one do you prefer over the others? I know many people used fishing gloves for photography (because of the removable finger caps) but right now there’s a whole new market of gloves designed specifically for photographers. Yeah, paying $200 for a product is a lot but it’s only Heat3 gloves that are that expensive. And the reason is because it’s built for EXTREME winter conditions. They certainly do the job keeping you warm for a long time and allowing you to work with your gear. Because it’s for deep winters, that’s why it has touchscreen finger tips instead of removable finger caps (so you don’t suffer from icicle fingers). I think the build quality, functionality and style are worth the price. And they work very well for everyday use in mid winters. I’m a newbie in photography but I have one question, How easy can you take pictures with the glove? I see you can take the caps out and leave your fingers exposed but how this works, is it hard to manipulate? Please tell me your experience about it. Thank you. The thing is that if you were to use regular winter gloves, then you’d definitely have a problem shooting in the cold. Or holding your camera (especially small compact ones). That’s why in the beginning of the article I mentioned that you won’t find the usual gloves for winter photography and/or heated gloves for photographers in this list. Instead I focused on ones that are specifically designed for cold weather photography (so it happens that some of them are known as “fishing” gloves which also work perfectly fine). The products mentioned in this list do satisfy this criteria. And allow you to work with your camera without any issues. Once you gain more experience with cold-weather photography and try some of the gloves, you’ll know what I’m talking about. Thanks for the comprehensive reviews. 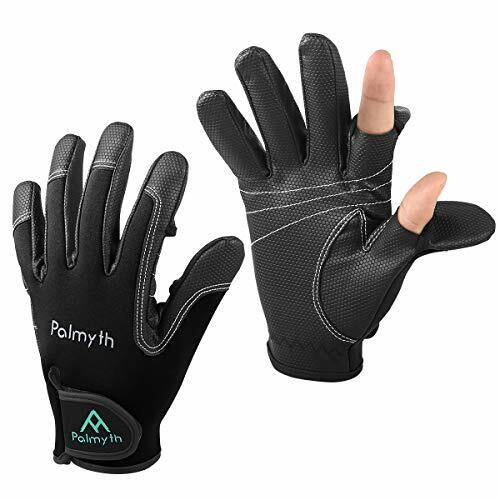 I am considering the Palmyth Gloves (No. 4) as they seem best suited to my needs (and budget!). Have you had a chance to examine an actual pair in person, and, if so, what can you tell me about the snaps that hold the finger covers back? Are they sturdy and do they snap firmly? I like the use of snaps as opposed to Velcro or magnets which might pose an issue with my camera. Thanks, and I hope your ankle is mending well. I haven’t tried them personally yet but I was thinking of getting them later this winter. Though can’t do much photography right now, I can use them for other purposes (thanks for the well wishes by the way!). I know for a fact that lots of photographers use this pair, especially if they are looking for a nice budget option. Also, based on what I saw ever since I published this post, Palmyth gloves were the ones that my website followers/visitors purchased the most. Not sure if its because of the 3 finger caps instead of two or what. Or perhaps it’s the price-value ratio. While these gloves have a wrist velcro strap, the finger covers attach to the back with metal buttons (so they should be firm enough for your camera operation). P.S. I enjoyed your photos, thanks for sharing your site! I removed the FB group because the ‘website’ section can only have one link, otherwise there’s an “error” notification. Oh, how I wish I had come upon your post a few weeks ago when I was covering a high school football game in the cold and wind of Minnesota! I kept having to take my gloves off to take the photos. BRRRR…. I wasn’t sure if I was going to feel my fingers again. I was falling in love with the FRDM Cold Weather Gloves until you said they aren’t so great below 40 degrees. We haven’t seen a day above 40 for several weeks now! However, in reading over the other gloves, it seems many of them do not work well in extreme cold, do they? I just feel FRDM have the features I need to be able to control my camera and still keep some of the wind and cold at bay. Thanks for the honest review of these products. It is appreciated. You’re right, most of the aforementioned options will not work for extreme weather conditions. If you often shoot in below zero temperatures, I’d suggest the Heat 3 smart layer system gloves (includes linen, mitten, warmer). Some very well photographers on the Internet use this particular glove. I’ll likely do a review of them in the near future, in case you’re still in doubts. Winter photography is my favourite, I just LOVE this season. I’d just shoot everything with snow on it like a maniac. The problem though was that my hands would get cold very quickly (I was using the usual glove and would take it off when I needed to take a shot). I didn’t even realize there were winter gloves specifically for photographers until I came across your post on Facebook. Oops. Thank you SO much for this useful resource. Really helped me make my decision. I’ll go with Palmyth for now! Palmyth is a great choice, indeed. A lot of people actually kept buying this particular glove, so I moved it from #4 to #1 on this “top rated” list of mine. Hopefully you like them like everyone else does!